Take a seat, Cedar Rapids. We need to talk. 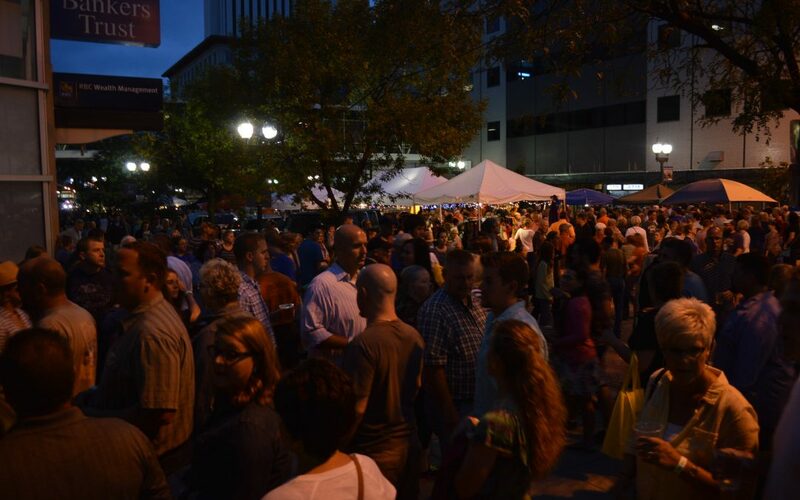 This weekend will mark the second edition of the Market After Dark, a nighttime farmers market in downtown. Last year, no one really knew what to expect with it being the first time such an event was held. What happened was an estimated 30,000 people descended upon the downtown district into a farmers market that had smaller boundaries which created a less than normal amount of space. Remember that? The immense crowds were in most cases too much to handle as they bounced between bars, shopped the vendors, and hung out in the streets. Hopefully, we’ve all learned what we can do to improve the event as we close in on Saturday. The real news this year is that the city is trying out a new concept: allowing patrons with special “Market After Dark” cups and wristbands to take their drinks from one bar to another, providing that its only beer or wine. That means, with good weather, you’ll be able to come into Bricks and get a draft pour of Big Grove Arms Race or Lion Bridge Yard Sale and hang out on 2nd Ave to drink it while you listen to live music. Therein lies the reason that we need to talk. This is a really neat opportunity for our city and can provide the groundwork and proof for the city to let us do things like this more often. But to do so we need to do it right. We need to keep the peace, so that police are not breaking up fights, or having to make arrests. We need to clean up after ourselves, so that the morning after doesn’t look like a tornado just went through (there are garbage cans downtown believe it or not). What I am saying is that we need to practice overall respect towards others and towards the property that we are being allowed to enjoy. 1. It’s going to be loud. Last year there was live music that included a DJ and when you add in 30,000 people the noise level is only going to amplify especially in the echo-chamber of downtown. Think before you come down. I would advise against bringing any children or pets. I think pets may be prohibited but even if they are not, just don’t bring them. Even if your dog is great with people, I saw many nervous and scared dogs last year whose owners were oblivious to that fact. 2. There are going to be lots of people. I’ve said this before right? That there were 30,000 people last year; you remember right? Well, in case you weren’t there it was insane. Many people know that they don’t like crowds so if this is you, steer clear. Even with full access to the street you couldn’t take more than a few steps without having to dodge out of someones way. 3. There are going to be lines. Be forewarned. This is not going to be like a regular Saturday night where it might only be a couple of minutes before you get a drink. Ever been to downtown Iowa City on a football Friday or Saturday night at one of their college bars? Yes, it is going to take some time to get a drink, and yes, you will get elbowed by other customers as they try to get through the bars. You may even get a little bit of a drink splashed on you. As a side note from a bartenders perspective, use the time that you are waiting to be helped to decide on what drink or beer you would like. You will most likely find that the bartender will move on to someone else if you wait until they approach you before you start scanning the draft tower. This will not be a night to ask for something new that is not too sweet, but not too hoppy, oh and not too light but also not dark. Go with what you know you like. Trust me, everyone will be happier in the long run. Well, thats it. There’s probably some piece of advice or some warning that I’ve forgotten to give you but for the most part if you follow these simple rules, you should find that you can have a good time at the Market After Dark. Remember, events like these are not a right, they are a privilege for us. Let’s all work together to try and keep this as something that we can continue to do in the future. It’s part of the next step in making our city more enjoyable. Thanks, Cedar Rapids. You’re the best. Outstanding blog post on how we can keep this event growing and improving. Thanks! My Favorite quote in the blog ‘Remember, events like these are not a right, they are a privilege for us. Let’s all work together to try and keep this as something that we can continue to do in the future.’ This needs to be said!! Good Job!! Please don’t bring your poor pets! With the loud noises and the amount of people that will be there, it’s just too much for them. They’ll be happier if you left them home.